Whether your allergies range from those mild to severe, finding pillows that won’t aggravate them at night is important. It’s crucial not only for your health but so you can sleep comfortably as well. Pillows are made for comfort after all, and if they can’t even give you that, then their function falls flat. It can be tricky to find the best pillow for allergies and asthma sufferers thus why we decided to write this review. If you’re looking for an affordable set of pillows that will help you sleep soundly, these pillows by Smart Home Bedding will do the trick. These Smart Home Bedding pillows are made with 50% cotton 50% polyester cover material, and filled with Shredded Polyester fiber. In addition, the pillows are compression-resistant, which means they don’t flatten over time. Hypoallergenic – which makes them ideal for people struggling with bothersome allergies or asthma. Fluffy – Although they arrived compressed in their packaging, once you open the package up and give them room to expand, they become very full and comfortable. Note: They may take up to 24 hours to fully expand, so don’t worry if they don’t immediately fluff up. Waiting for the pillows to expand after being compressed in their package during the delivery process may be a nuisance, but if you plan and open them up at least a few hours before using, they should be fine. 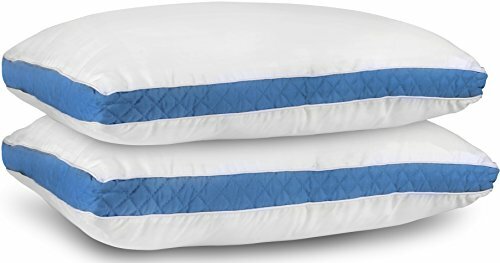 Depending on your preference for soft pillows, these would probably earn a 7/10 rating for softness, but they are supportive, making them great for those looking for both softness and comfort. For those that are looking for a comfortable, hypoallergenic set of pillows, these are a great option to consider. For those searching to find the best pillow for allergies and asthma sufferers, this pack of pillows by Utopia is a suitable option to consider. With their hypoallergenic quality starring as one of their primary positive features, they are made specifically to help make those with allergies and asthma feel comfortable during sleeping hours. As they are manufactured 100% free of all harmful substances, these pillows are made specifically to cater to those looking for an affordable, hypoallergenic slumber companion. In addition, the pillows are made with good quality materials, allowing for comfort that extends beyond their hypoallergenic feature. They are filled with 100% Polyester gel fiber. The quilted material and double-stitching not only gives the pillows a luxurious appearance, but it helps the products last longer as well. The firmness of the pillows is moderate. Although they may appear compressed initially, that’s only because they are vacuum-packed within their packaging. They will expand fully within 24 hours or so of opening. 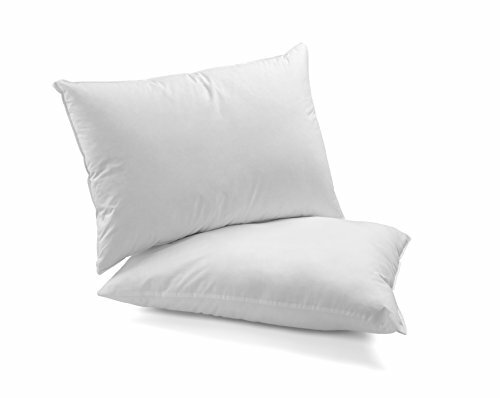 The pillows are soft, but not so much so that you feel as though you’re resting your head on a piece of flat cloth. Depending on your preference for fullness when it comes to your pillows, you may be underwhelmed by these. Although they expand from their compressed state from the packaging process, they are still somewhat thin in comparison to some expensive options. check Because of their moderate thinness, these may not provide the level of support some may be accustomed to. These Utopia pillows come at good value for their price. There are not many affordable options out there for pillows that stay true to their advertised hypoallergenic features, but these are pillows are truly ideal for allergy and asthma sufferers. If you are not picky about the level of firmness, the pillows are a comfortable companion that will help you sleep comfortably through the night. Yes. I know that in choosing the right pillow for me will take a lot of choices. Thanks for these detailed lists for us who have allergies. I really appreciate that it has something you take time on. I can see also that there are more different pillows as well to add up these whole pillows and I hope it could reach other viewers as well.